Lucky 7s Classic Slot Guide & Review - Casino Answers! 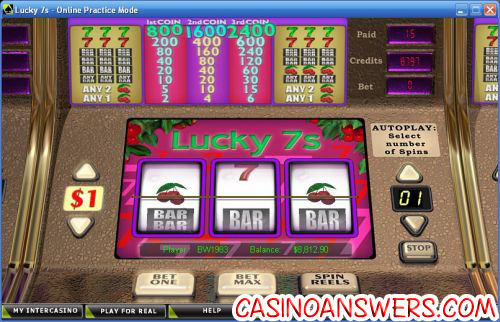 Lucky 7s is a 3-reel, 1-line classic slot machine developed by Cryptologic. You can play the Lucky 7s classic slot game at VIP Casino and InterCasino. Bets on the Lucky 7s classic slot machine are: $0.01, $0.05, $0.10, $0.25, $1, $2 and $5. You can play from 1-3 coins using “Bet One” and “Bet Max.” The lowest total bet you can make on Lucky 7s is $0.01 per spin. The highest total bet possible on Lucky 7s is $15 per spin. To play Lucky 7s, hit the “Spin Reels” button or hit “Bet Max” for the maximum 3-coin bet. The highest paying symbol on the Lucky 7s slot machine is the Green Seven symbol. If you bet 3 coins and hit 3 Green 7s on the center payline, you will win the top jackpot of 2400 coins. The next highest paying symbol is the Red Seven symbol at 600 coins. To try and win the top jackpot on the Lucky 7s classic slot game, head on over to VIP Casino. There are 9 winning combinations on the Lucky 7s classic slot machine from Cryptologic. The full payout schedule is as follows (1/2/3 coin payouts in parenthesis): 1 Cherry symbol (2/4/6), 2 Cherry symbols (5/10/15), 3 Cherry symbols (10/20/30), 3 Single Bar symbols (10/20/30), 2 Double Bar symbols (40/80/120), 3 Triple Bar symbols (80/160/240), 3 Red Seven symbols (200/400/600), 3 Green Seven symbols (800/1600/2400). To use the autoplay feature on the Lucky 7s slot machine, select the number of spins under “Autoplay” using the up and down arrows. To start the autoplay spins, hit the “Bet Max” or “Spin Reels” buttons. To cancel autoplay, hit “Stop” below the number of autoplay spins. Lucky 7s is not a high paying slot machine by any means, but it does give the player a chance to get some smaller wins. Get a $225 signup bonus to play the Lucky 7s classic slot machine and many more slot machines at VIP Casino! Are players from the United States able to play Lucky 7s for real money? Unfortunately, players from the United States are unable to play the Lucky 7s fruit machine or any of the games at Cryptologic online casinos for real money. For a great selection of classic slots that American players are welcome to play, please visit the US-friendly Silver Dollar Casino. What is the difference between this Lucky 7s and the other one? The Lucky 7s slot game that is reviewed here is a 3-reel classic slot machine, whereas the Lucky 7s Vegas Technology slot game is a 7-reel, 7-line video slot. You can play the other Lucky 7s slot machine at Silver Dollar Casino. Is there a lucky 7s slot online? Is there a lucky sevens slot online?